The United States Congress designated the James Peak Wilderness (map) in 2002 and it now has a total of 17,109 acres. All of this wilderness is located in Colorado and is managed by the Forest Service. 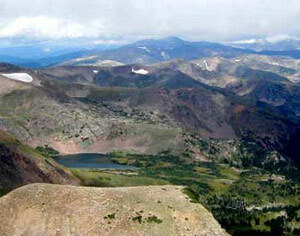 The James Peak Wilderness is bordered by the Indian Peaks Wilderness to the north. The James Peak Wilderness encompasses 14,000 acres on the east side of the Continental Divide in Boulder, Gilpin, and Clear Creek Counties of Colorado. The area is named after its most prominent peak, 13,294 foot "James Peak," in honor of Dr. Edwin James, an early explorer, historian, and botanist who was a member of the famous Stephen H. Long expedition to Colorado in 1820. There is approximately 20 miles of trail. The area's elevation ranges from 9,200 to 13,391 feet at the summit of Parry Peak, which includes upper montane, sub-alpine, and alpine ecosystems of the Rocky Mountains adjacent to the Continental Divide. Planning to Visit the James Peak Wilderness? How to follow the seven standard Leave No Trace principles differs in different parts of the country (desert vs. Rocky Mountains). Click on any of the principles listed below to learn more about how they apply in the James Peak Wilderness.